It often amazes me that a website for a small town like Shoreham attracts visitors from around the world including particularly Australia, America and Canada. One though was especially surprising coming as it did from Estonia and concerned a rather special Shoreham built ship. 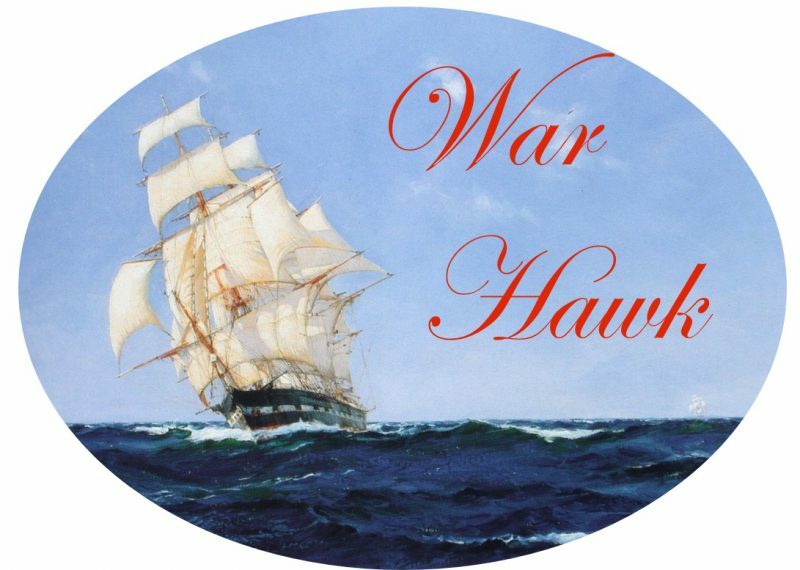 The launching went very well and the ‘War Hawk’ was christened ‘in the usual manner by a bottle of wine thrown at her bows from the hands of a young lady.’ As with most of Balley’s ship launchings the celebrations would have continued with dinner, dancing and entertainment at his nearby Swiss Gardens well into the night. She had been 16 months in the making and had a greater length (140 feet) for her tonnage than any other sailing vessel at the time, so long that the dock in Balley’s yard could not accommodate her and she was laid alongside the Customs House quay, behind the old Town Hall, to be rigged and fitted out. 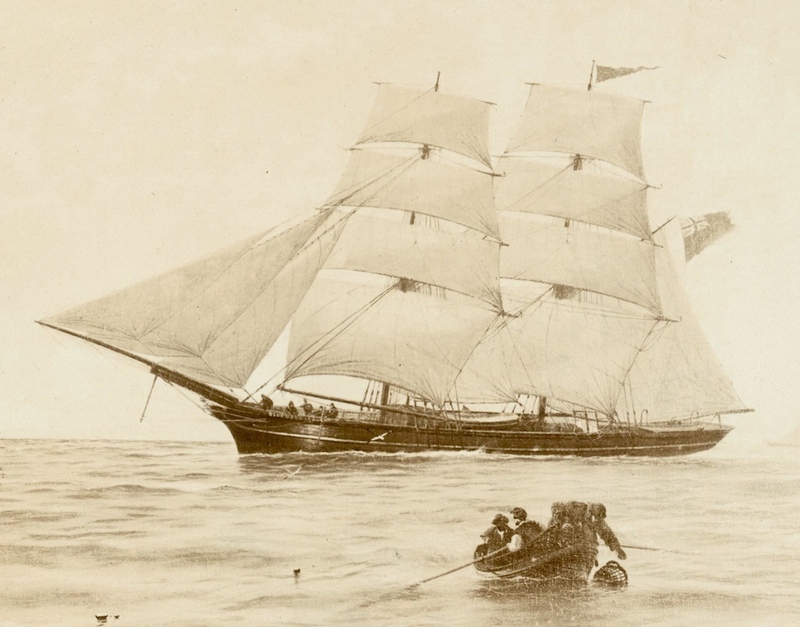 Her first owner was Captain T. Bartlett and for some ten years the War Hawk traded successfully between Shoreham, London and the Baltic until it was lost in 1863 during a storm on the return voyage from Kronstadt, the island port for St. Petersburg. The crew was largely made up of young men in their late teens to early twenties plus a fourteen year-old youngster John Munday from Liverpool. Most came from the British Isles (although none from Shoreham) with one Jamaican and another from Canada. The captain was Rowland Williams, 46, from nearby Littlehampton and the mate fifty year-old Glaswegian William Brown. 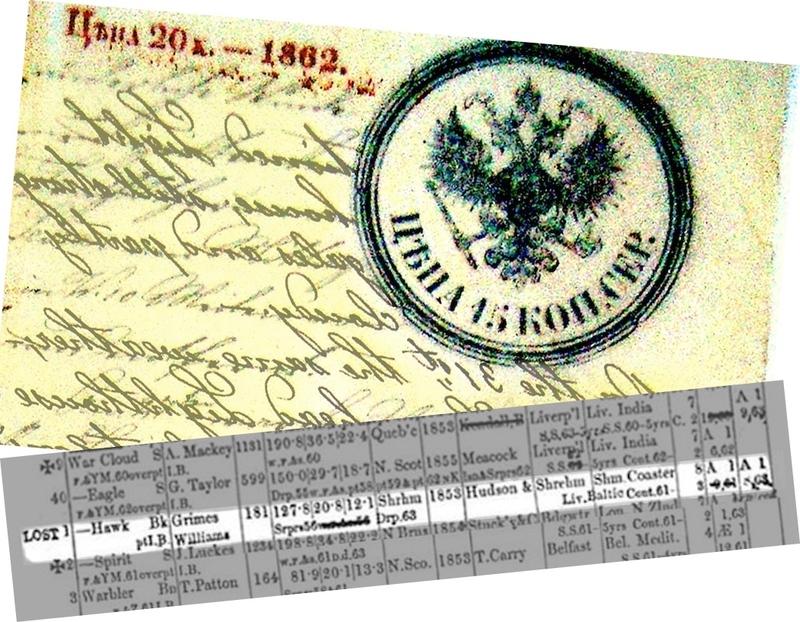 The War Hawk had arrived at Kronstadt and taken on board ‘a convenient cargo of wheat bound to London.’ Everything was well, the vessel was recorded as being ‘tight and good and well provided with everything necessary for the intended voyage.’ The ship warped at the mole head of Kronstadt on the 22nd October 1863 and anchored at 4pm in the nearby roads. The next few days they continued laboriously on as the headwinds made tacking necessary made even more difficult by a heavy swell on the sea. On the 27th in company with several other vessels that were finding the going hard they anchored for the night in the lee of the island of Seskar off the coast of Russia. The next day the wind had veered round making progress easier and by 8am on the 31st they had reached Kockskar lighthouse but strong gales were now threatening. By 4pm they neared Surop Head lighthouse but the heavy gales and ‘thick weather’ provided very poor visibility. At midnight the weather improved a little and War Hawk made the Packerort Light but by 8am the gales rose once again. Land was seen but once again the weather prevented recognition of its whereabouts and the ship was labouring heavily under the press of canvas. In rough seas it wasn’t unusual for those old wooden ships to take in water and the pumps had to be used from time to time but now more water than usual was coming in. On the 1st November it had become impossible for them to make headway to the next waypoint at Port Baltique so they returned eastwards back towards the Reval Roads for anchoring. On rounding Surop Point at 3.30pm the lead was cast and found no bottom at 10 fathoms but ten minutes later the ship struck an obstruction and remained fast. Efforts to back the ship off were to no avail and despite working the pumps five feet of water accumulated in the well that soon increased to 7 feet. Putting their clothes and possessions in the boats they stowed the sails and left the ship at 5pm. As they pulled away they noticed pieces of the false keel floating away – these were fitted to most Shoreham-built vessels to avoid damage to the main keel from the harbour bar that had constantly impeded ships there for centuries. Despite the storm the crew made shore safely and as they watched the War Hawk fell over on her beam ends and began to break up as the wind drove the wreck into the sea. The affidavit was made at Reval the next day and the crew returned home to eventually receive their discharge papers on 17th November. That was the sad end of the War Hawk but not quite the end of the story. 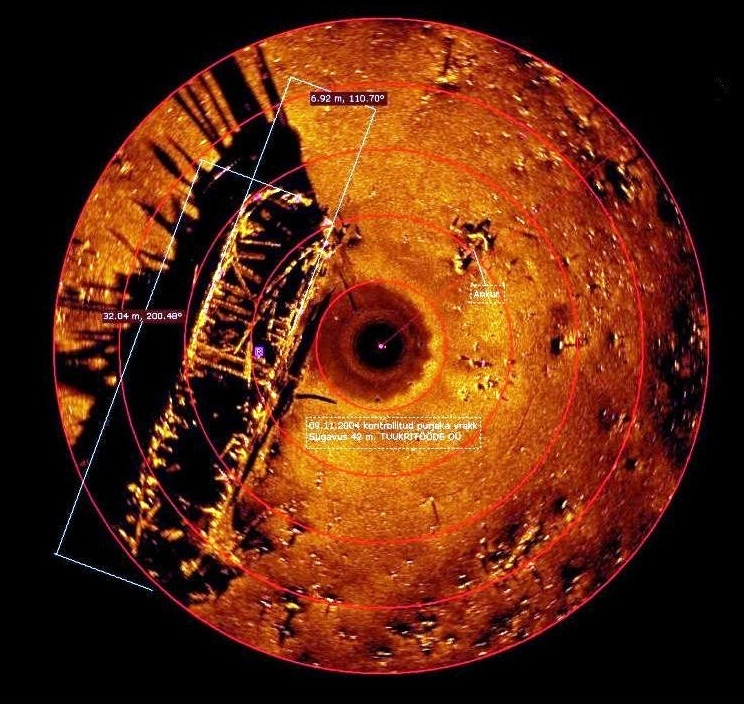 In addition to the affidavit the Estonian archaeologists sent through a photo of the wreck they believe may be the Shoreham ship, a fascinating sonar image that includes the ship’s anchor. Masters Logs and crew list for War Hawk No 1384 File no SR/4 1862 – 1863 held in, West Sussex Record Office, Sherburne House, 3 Orchard Street, Chichester. Affidavit of Captain R. Williams and his ship’s company of the British Barque War Hawk, which on their voyage from Cronstadt with a cargo of wheat bound to London had the misfortune of their vessel running in a heavy gale up on an unknown ground off the lighthouse of Surop, where she broke up before anything could be saved. We the undersigned Master and crew of the above mentioned ship do testify, that after having taken on board at Cronstadt a full and convenient cargo of wheat bound to London and our vessel then being tight and good and well provided with everything necessary for the intended voyage, we warped at the Mole head of Cronstadt on the 22nd October n. s. 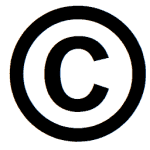 (i.e., new style) and anchored at 4 pm in the roads. The next day, the wind going round to South we set all sails and proceeded on our voyage. At noon it began to blow very hard from S.S.W. with rain and a heavy head sea, and we were obliged to return in Cronstadt roads in company with many other ships. On the 25th at 10 am the weather clearing up with light wind from North, we weighed and set all sails to get her with about 50 other vessels. This Log contains 12 hours and ends at noon to commence the sea Log. On Monday the 26th variable wind, at noon we had the lighthouse of Seskar in W. distance 10 miles. On the 27th W.S.W. winds strong breezes and cloudy weather tacking occasionally, crew various employed and pumps carefully attended to. At 6 pm bore up for Seskar Island in company with several vessels and anchored there at 7 o’clock in 7 fathoms water. On the 28th strong breezes from W.S.W. and cloudy. At 8 am the wind varied round to S.W. when we again weighed and continued our voyage. The 29th same wind, carried all possible sails, pumps carefully attended to. At 2 pm the beacon of Nervo Foreland bore N.1/2E. distance 6 miles. Midnight strong breezes with a short heavy sea. The 30th begins with a strong wind from the south. At 6 o’clock pm strong gales and clear weather. At 8 pm Kockskar light bore S. by E. distance 4 or 5 miles. Midnight strong gales from S.S.W. went under the land till daylight when we proceeded out. At 8 am passed the last mentioned lighthouse, still strong gales and partly cloudy. On the 31st the same weather, at 4 pm Surop head lighthouse bore S. by W. distance about 8 miles. Heavy gales continuing with rain and thick weather that we could see nothing. On midnight it cleared up a little and we made Packerort light bearing S.E. by E. distance about 8 miles. At 8 o’clock am the gales increasing, wore ship to E.S.E. the wind being S.
We saw land bearing from South to S.E. but could not make it out on account of the weather being very thick. Heavy storm with rain continued, the ship labouring heavily under the press of canvas. This hard storm continued without interruption the next day being the 1st of November. The vessel made then a little more water than usually, the pumps were carefully attended to. At 2 o’clock pm we came in with the tischport (?) land in smoother water and saw Port Baltique bearing about S.W. 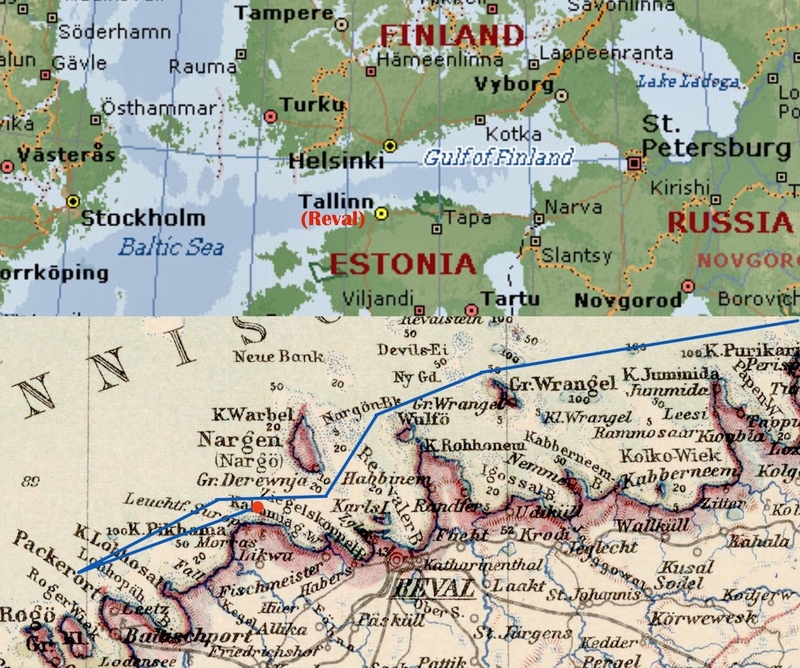 and Surop Head E. by S.
At 3 o’clock pm it being impossible to fetch Port Baltic, wind and weather being too hard, we bore up for Reval roads and made everything ready for anchoring, we steered East. At 3 hours 30 minutes pm on rounding Surop point the same bearing S.S.W. 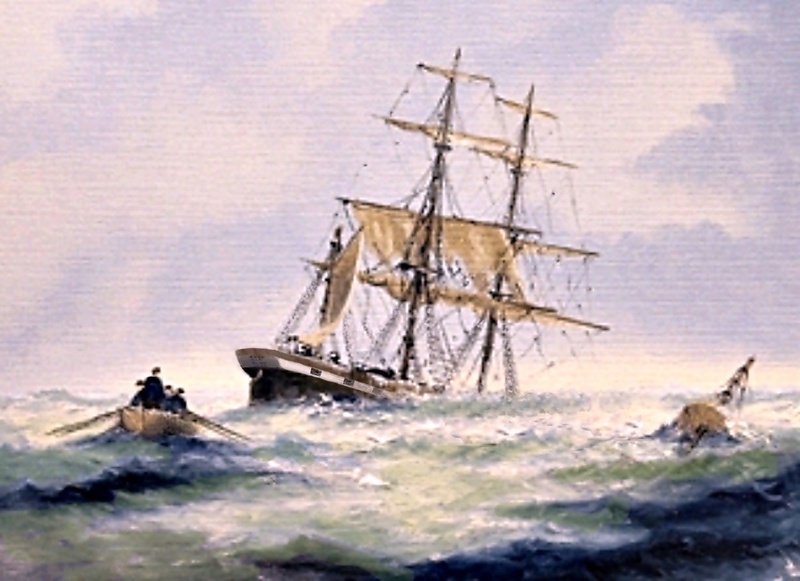 the second Mate casted (sic) the lead and found no bottom with 10 fathoms; about 10 minutes afterwards the ship struck suddenly and remained fast. We sounded the pumps but found she made no water. Tried to back the ship off but she continued to strike and began to make water our(?) fast; we kept the pumps at work until we got 5 feet in the well. Now we put the boats out and the best part of our clothes in the same, which done, the water had increased in the well to 7 feet. At 5 o’clock pm after stowing the sails we left the ship and saw pieces of the falth (sic) keel floating away. About 5 o’clock 30 minutes we landed all safe. Heavy rain and sea on the beach continued yet at midnight. At 7 o’clock am the ship fell over on her beam ends and began to break up fast. The wind being off the land the wreck drove to sea. That the foregoing is the real truth and that we have done our duty as honest seamen, such we are ready to declare on oath.